The following four fleets did their research and found that the already established propane autogas fueling infrastructure provided a more cost-effective business case compared to the alternatives. Each company either converted their vehicles or purchased new vehicles and chose either bi-fuel or both bi-fuel and dedicated propane autogas. 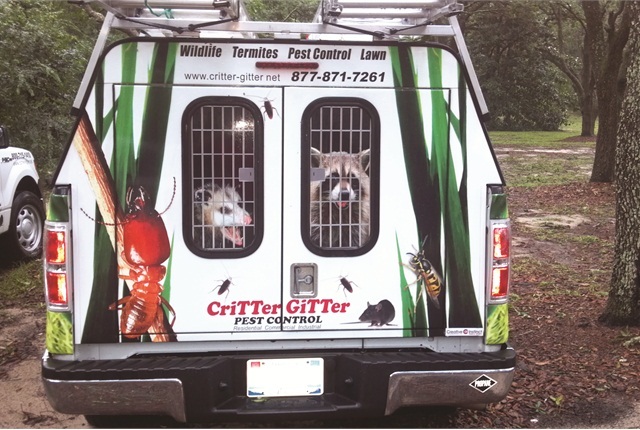 Lewis Pest Control uses a Prins bi-fuel propane autogas system, which starts on gasoline and switches to propane autogas after the engine heats up. Lewis Pest Control is a family-owned residential and commercial pest control company serving South Alabama and Southeast Mississippi. 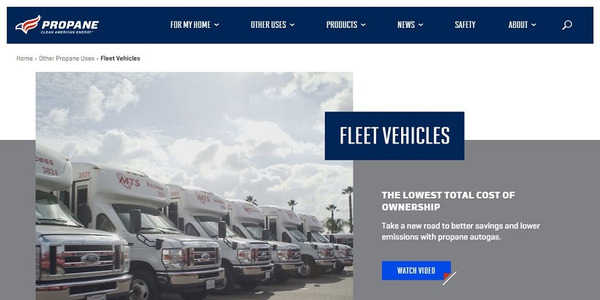 Of 40 total fleet units, the company converted eight to run on propane autogas: three Chevrolet ½-ton and two ¾-ton pickups as well as three Ford F-150s. Two more conversions are on the way. Lewis uses a Prins bi-fuel propane autogas system, which starts on gasoline and switches to propane autogas after the engine heats up. He struck a deal with his local dealership, Brooks Chevrolet of Thomasville, Ala., to train a service technician on installing the conversions and servicing them. Lewis said the dealership had to get up to speed on the conversions, which caused initial delays. However, “the last two went relatively smooth,” Lewis said. 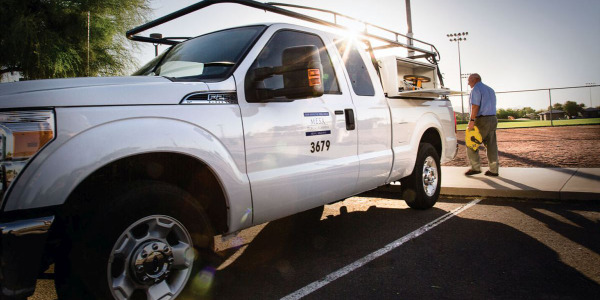 With total annual savings of $16,573, Lewis Pest Control calculated a return on investment in 13 months for its eight bi-fuel propane autogas and gasoline trucks. The calculations include the truck conversion costs and fuel costs for both gasoline and propane autogas, minus grants. The per-gallon propane autogas cost also factors in a 10-percent loss in fuel economy compared to gasoline. The Prins conversion cost Lewis $5,800 per unit. The company converted three trucks and then secured a grant from the Virginia Clean Cities program to fund the other five. The cylindrical propane tank is installed in the truck bed against the back of the cab. According to Lewis, there was a little grumbling in the beginning regarding the loss of bed space, though it just forced the technicians to be better organized. The smaller trucks have 60-gallon propane autogas tanks while the larger ones have 80-gallon tanks, providing a 600- to 700-mile range. The average fuel economy for the company’s propane-autogas-powered fleet is 13.5 miles per gallon, which includes a 10-percent loss in mpg with propane autogas. The cost of the propane autogas per gasoline gallon equivalent (GGE) runs about a dollar a gallon less than gasoline. The company had enjoyed a 50-cent tax credit for the fuel, though that expired. That was hard to swallow, Lewis said, though the savings are still substantial. Lewis said the company is saving $1,380 per month in fuel, or more than $16,000 a year total. This translated to a return on investment in 13 months. The route trucks average 30,000 miles per year and gain up to 250,000 miles total before retiring. 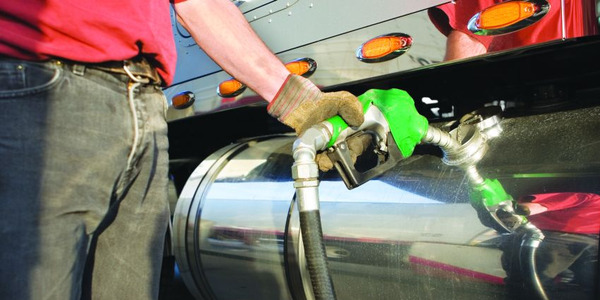 The propane-autogas-powered trucks burn about a tank of regular gasoline per month. Lewis installed propane autogas tanks at two of the company’s locations using two different propane autogas providers. Each provider agreed to furnish the tanks for free in exchange for the fuel contract. Lewis hasn’t remarketed a truck yet, but he’ll experiment with removing the propane autogas system from the de-fleeted vehicle and installing it on the new vehicle for a second life. With four years using propane autogas, Lewis said the initiative has worked well internally and externally. The propane autogas supplier for Lake Michigan Mailers installed the fueling pump and tank — as well as extras such as concrete barriers — on the company premises for free in exchange for a fuel contract. David Rhoa, president of Lake Michigan Mailers Inc., brought in a fleet adviser to navigate his company’s path to alternative fuels. “I obviously had to run the trucks every day and I needed someone else to do the math and the logic and look up best practices and trends,” he said. The document management company uses its fleet primarily for the collection and processing of mail and “banker boxes” full of documents to scan. 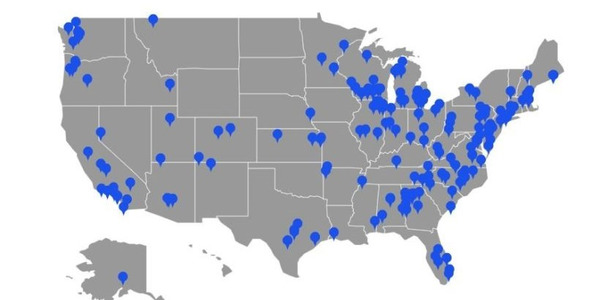 The company’s fleet of 30 vehicles — predominantly Ford E-150 cargo vans and one Ford Transit Connect — covers an 89-mile radius from the Kalamazoo, Mich., home office and also serves a processing center in South Bend, Ind. Rhoa said the company first researched using electric vehicles. “We found that electric vehicles could work in a limited role, but the more practical application was between compressed natural gas (CNG) and propane autogas,” he said. In regards to CNG, Rhoa understood the high costs to install a tank onsite, even a slow-fill one, and knew his local mechanic wasn’t about to install equipment such as a methane detection system needed to service the highly pressurized natural gas. “All my savings would get eaten up by infrastructure and maintenance costs,” he said. Ultimately, Rhoa looked at vehicle, conversion, and fuel costs, and the range and infrastructure necessary to support [different choices]. “The only one that answered all those questions as a ‘yes’ was propane autogas,” he said. The company has converted four vans to bi-fuel gasoline and propane autogas using a conversion system from Icom North America, with two more due in November. The conversions cost $6,300 to $6,500. Rhoa delivered the trucks to the Icom facility in Michigan and picked them up three to four days later. Rhoa said propane autogas providers were eager to install the fueling pump and tank — as well as extras such as concrete barriers — on the premises for free in exchange for a fuel contract. And, that’s with the knowledge that Rhoa would use the pumps initially to fuel only two trucks. Rhoa committed to a five-year deal. Lake Michigan Mailers ended up investing about $8,000 of its own funds in infrastructure, which included installing an electrical supply, lighting, a camera system, and safety equipment. The company built its ground pad big enough to handle a second propane autogas fueling tank. 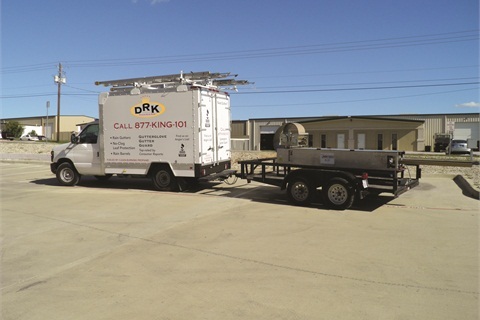 The propane autogas tank in the truck bed helps add tongue weight — the downward force the trailer tongue applies to the hitch — to the Dallas Rain King trailers. As with many propane autogas converts, it was the yo-yo price of fuel a few years ago that got Gary Kulp interested in using the alternative fuel. Kulp, president of Dallas Rain King, a rain gutter installation and maintenance company servicing Dallas and Austin, Texas, also wanted to minimize his reliance on overseas oil and become more eco-friendly. In a fleet of 20 vehicles, Kulp runs six with propane autogas: three Ford F-150s, a Ford E-350 cutaway, and an E-450 cutaway, all with ROUSH CleanTech dedicated systems, as well as a Chevrolet Impala with an aftermarket bi-fuel conversion from Prins. Kulp said propane autogas fits in well with how the company uses its fleet. The loss of cargo space due to the propane autogas tank in the pickup bed or truck box is not an issue; it actually helps to tow the company’s trailers. The placement of the tank moves the center of gravity forward on the truck, allowing for greater tongue weight with the trailers, which carry 5,000-10,000 pounds. Kulp said that even when towing a full trailer there is no loss of horsepower with propane autogas compared to a regular gasoline engine. Dallas Rain King converted the Impala with an aftermarket bi-fuel conversion to defray the costs in covering the company’s wide service territory, though he recommends the ROUSH dedicated system for work truck applications. ROUSH’s liquid propane injection system suffers no horsepower loss and still maximizes fuel efficiency. While the bi-fuel system costs substantially less, it is based on older, less efficient vapor injection technology. While the state of Texas has the greatest concentration of public propane autogas fuel locations, Dallas Rain King had a fuel pump installed onsite. Kulp pays about $1.50 per gallon, which is down 35 percent from last year, Kulp said. One unexpected benefit of propane autogas is the elimination of fuel theft because employees can’t fuel up a personal vehicle. “It’s endemic in the service industries,” he said. Kulp understands that propane autogas leaves a cleaner engine — he’s expecting to get 300,000 miles out of his trucks — yet he has tightened his oil change intervals. Kulp maintains that it’s harder to tell how clean the oil from a propane autogas vehicle is because the carbon that propane autogas leaves is lighter than the usual soot color left by traditional gasoline. “I researched the issue and found we should change every 5,000 miles to be safe,” he said. While Kulp was able to take advantage of a federal subsidy on his original conversions, the company’s propane autogas initiative is not presently subsidized. While propane autogas seems to stand on its own right now without those grants or tax breaks on fuel, some relief would be fair, Kulp said. Propane autogas users, in effect, pay higher road taxes, and while the per-gallon tax is the same, propane autogas delivers only 70-90 percent of the range of a gallon of gasoline. Kulp also pointed out that the EPA’s cost to certify a vehicle model for a dedicated conversion is very high, and much of that cost must be passed on to the end-user. 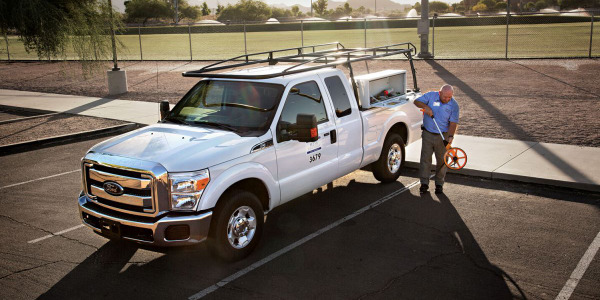 Denison Landscaping is ROUSH CleanTech’s first landscaping customer to purchase ROUSH’s 2012 model-year propane autogas F-250. Josh Denison, human resources and operations manager for metro Washington, D.C.-based Denison Landscaping, had done some research over time on propane autogas, yet it wasn’t until a fellow landscaper touted the fuel’s benefits that prompted the company’s first move. Denison investigated compressed natural gas (CNG), but found the conversions and infrastructure were too expensive. “Propane autogas has been the way to get into the green fuel market,” he said. 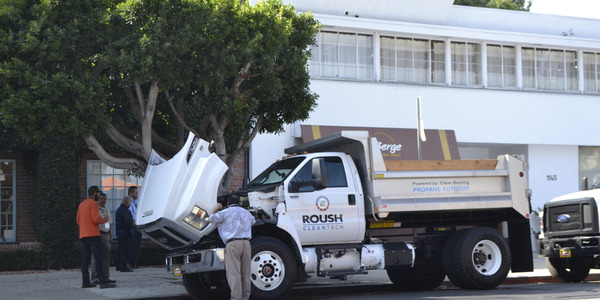 In October 2011, the company purchased two 2010 Ford F-250s with ROUSH CleanTech propane autogas conversions that came out of the ROUSH demo fleet. Denison first used the trucks only for management vehicles, and after registering their solid performance as well as initial fuel savings, he moved one into the residential maintenance division. In the spring of 2012, the company converted its lawn equipment to propane autogas as well. 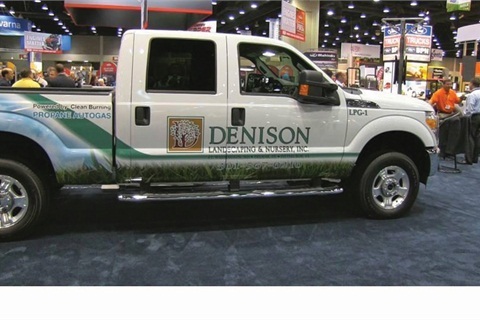 Denison is in the process of buying another propane autogas demo truck, a Ford E-450 box truck, to use in the maintenance and nursery production segment. Because the fleet racks up high mileage — the propane autogas truck on the maintenance route travels 150 to 200 miles a day — the fuel savings equates to about $1,000 a month. With that mileage, the conversion will have paid for itself in about 14 months, Denison said. That’s without federal grants, which ran out by the time the company purchased the trucks. Denison first started fueling at a local U-Haul store, a 10-minute drive from the office, as well as at two propane autogas distributors conveniently located on drivers’ routes. The pumps were slow-fill, which added about a 10-minute fill time compared to a commercial gasoline station, Denison said. The company then cut a deal to have an onsite fast-fill fueling depot installed. Denison switched propane autogas suppliers in the middle of the installation process. 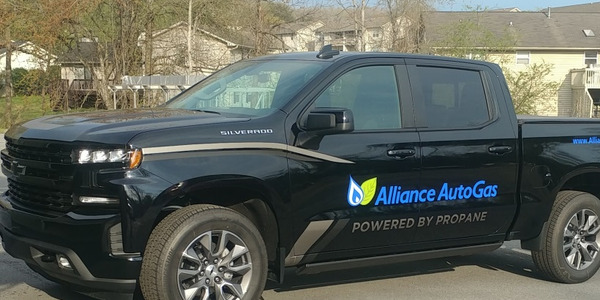 For more than four months, the propane autogas supplier was delivering fuel to the office two times a week to fuel the vehicles and equipment directly from the bobtail fuel truck. When the onsite depot was finally dispensing fuel, “It was a very good day,” Denison said. The company pays about $2.25 per gallon, significantly less than at a retail propane autogas station, according to Denison. Even with only two trucks to fuel, Denison said, the supplier still agreed to subsidize the pumps. 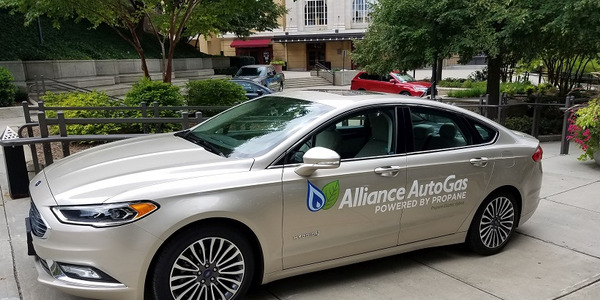 He said the incentive for propane autogas suppliers to sell to the landscape industry is an opportunity to boost their sales during landscaping season in the warmer months, when residential and commercial accounts don’t use as much fuel. 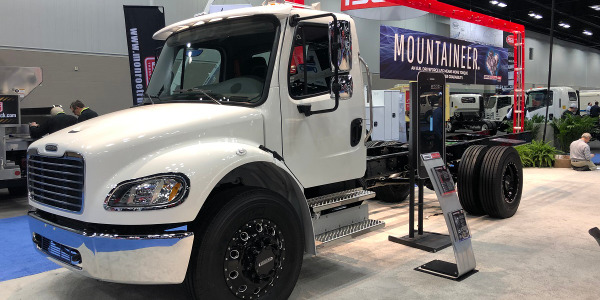 The propane-autogas-powered engine takes an additional seven seconds to start compared to a regular gasoline-powered truck, noted Denison, but that, there are no other differences in performance.